Growing inequality within and between countries has become one of the defining issues of our age. It seems a week cannot go by without another damning report looking at the size and harmful consequences of this pervasive problem. Most recently, Credit Suisse reported that just a tiny 1% of the world’s population possess nearly half of all its wealth. In other words, 1% of the richest individuals own more than 3.5 billion people put together. If that wasn’t bad enough, tax justice campaigners suggest that the situation could be even worse because many estimates of inequality discount the money and assets hidden away in secretive offshore locations. As it stands, the rich are getting ever richer whilst the poor are becoming even poorer. This is a global crisis with a devastating impact. Inequality is denying populations across the developed and developing world access to the services required to meet their basic needs. This is terrible news not just for people’s human rights now, but also for our collective future. Without adequate financing, we cannot achieve our long-term development goals or being to face issues such as climate change. The Global Alliance for Tax Justice works for a world where everyone receives a fair share of its prosperity. Tax is a powerful tool for ensuring that resources are shared out more fairly amongst people. But for people to receive their fair share, everybody has to pay in their fair share. At the moment this is just not happening. Certain rich people and multinational corporations are refusing to contribute to society by exploiting legal loopholes and avoiding paying billions in tax. Each year Africa loses out on £60 billion in revenue, which is more than it receives in aid, and yet more is lost in North and Latin America, Europe and Asia. Just think of the schools that could be built, the healthcare provided and the opportunities that could be generated if democratic governments had access to this cash. Representing a coming together of people and organisations all over the world, the Global Alliance for Tax Justice aims to end once and for all the damage being caused by such extreme inequality. There are some $21-32 trillion in financial assets hidden in offshore secrecy jurisdictions or tax havens as they are more commonly known. As it is hard for governments to trace the ownership of this wealth, it goes largely untaxed, hugely increasing inequality within and between countries. At the same time, current accounting rules allow large corporations to get away with hiding where their true profits are made, meaning any tax avoidance can occur unnoticed. Whilst a movement towards greater transparency has begun, there is still much work to do to shine a light on how money really moves and where it is stashed. Within countries, elected governments have a choice about how to collect tax. They tend to choose a mixture of different taxes, some regressive, some progressive. Regressive taxes hit the poorest hardest, significantly reducing their total income relative to the impact it has on wealthier individuals. Examples of these include flat rate taxes or indirect taxes such as VAT. On the other hand, progressive taxes increase on those with more ability to pay, thus helping to share out some of the wealth accumulated at the top so that the whole of society benefits. In a highly globalised world dominated by large multinational corporations, it is essential to ensure that taxes are paid where the true economic activity occurs. Under current global rules, this is often not the case, and companies are able to shift profits around the globe to places where they will be taxed less. This has a particularly devastating impact on developing countries. To combat the problem, we need to develop a new set of rules and to ensure that all countries voices are heard during the process. The Global Alliance believes that tax justice has to be a central part of any inequality-focused agenda. In 2015, we will be working on this issue via our global campaign to make multinationals pay their fair share. 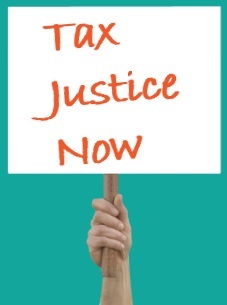 We urge all others working on inequality to sign up, and help us to take forward the discussion of how tax justice can support social justice for all.